Media coverage about suicide may be a factor in others’ decisions to take their lives by suicide. 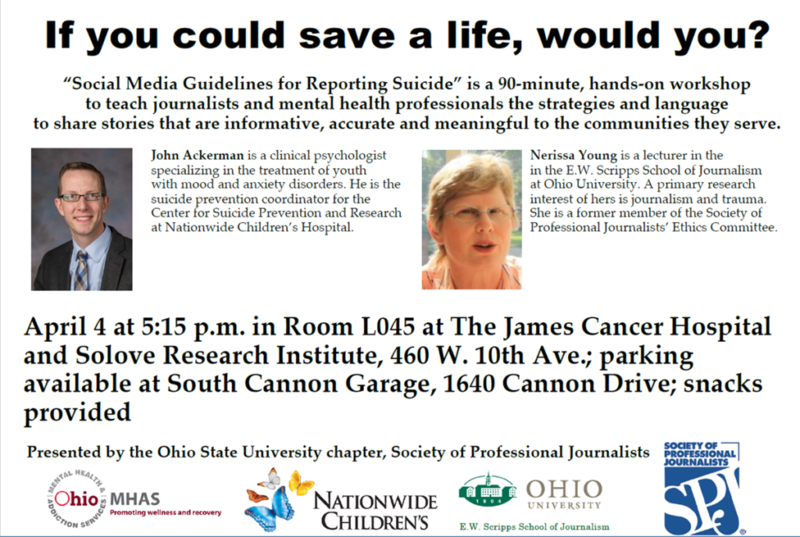 That’s the premise behind a series of six workshops around Ohio that will teach campus and professional journalists the strategies and language they should use to report suicides in an informative, accurate and meaningful way to better serve their communities. Suicide is the 10th leading cause of death in the United States and the second leading cause of death among teens and young adults ages 15-34. The fourth workshop will be at The Ohio State University on April 4 at 5:15 p.m. in Room L045 at The James Cancer Hospital and Solove Research Institute, 460 W. 10th Ave. There is no fee to attend and preregistration is not required. Parking will be available at South Cannon Garage, 1640 Cannon Drive. It is presented by The Ohio State University chapter of Society of Professional Journalists. Snacks will be provided. The workshop is a collaboration among the Ohio Department of Mental Health and Addiction Services, Nationwide Children’s Hospital and the E.W. Scripps School of Journalism at Ohio University. For more information contact Nerissa Young, lecturer, E.W. Scripps School of Journalism, at youngn2@ohio.edu or 540-599-7472.